Welcome to the six hundred and ninth of my blog interviews with novelists, poets, short story authors, biographers, agents, publishers and more. Today’s is with non-fiction author Yves Johnson. A list of interviewees (blogged and scheduled) can be found here. If you like what you read, please do go and investigate further. Morgen: Hello, Yves. Please tell us something about yourself, where you’re based, and how you came to be a writer. Yves: Hi Morgen. I’m the Founder of Christ Is My Savior Ministries. I’m a preacher by trade and I’ve just started my “moonlighting” career as a writer. I was based in Fort Washington, MD but my family and I moved to Tucson, AZ this June. God inspired me to write this book. I wanted to write an entirely different book! Morgen: Maybe you could write that one next? What have you had published to-date? 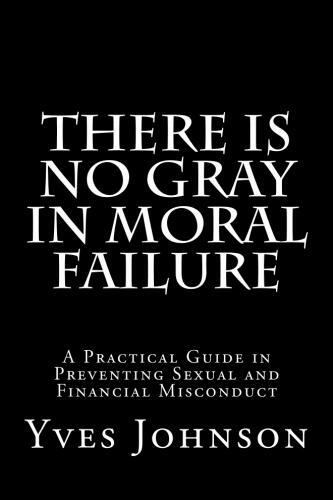 Yves: I wrote There Is No Gray In Moral Failure: A Practical Guide In Preventing Financial and Sexual Misconduct. Yves: I spoke to several well-known publishing companies. I thought I was going to go with one but I did not like some of the restrictions. I spoke to several self-publishing authors and liked everything about controlling the birth creation of my first book. Morgen: I’ve been offered a couple of publishing contracts and felt the same (although I’m still on good terms with both publishers). I did everything myself and it was fun. Is your book available as an eBook? Do you read eBooks or is it paper all the way? Yves: No, it is not an e-book yet but I plan on having it as an ebook. I read paper books. I’m going to the Ukraine so I will try ebooks and see how I like them. Morgen: I’m sure you’ll enjoy them. It’s different to the real thing (most people say not as good) but I have 400+ books on my iPad so imagine lugging those around. Did you have any say in the titles / covers of your books? How important do you think they are? Yves: Yes, I had total say in creating my title. I think it’s very important since it’s the first thing to catch a prospective reader’s eye. Morgen: It is, that’s true. Do you manage to write every day? Do you ever suffer from writer’s block? Yves: No, I did not write everyday. I was transitioning from my military career. Plus we moved three times within 14 months. Then I had leg surgery. So, I had a lot of things going on. I think those breaks helped prevent me from having writer’s block. Morgen: Ouch, what a tough time. Do you do a lot of editing or do you find that as time goes on your writing is more fully-formed? Yves: I did a lot of editing. After I thought I thought I had a great product, I hired a professional to look at it. I found that I wasn’t as good of as an editor that I thought I was. Morgen: It’s always hard to edit your own work. I went through my debut novel about five times and then my first readers still found glaring errors. No-one, even the best writers in the world, should rely on themselves. At least put the manuscript away for at least a month so you feel like a stranger to it. Do you have to do much research? Yves: I spent a lot of time in research. I found a lot of surveys that backed up my claims. However, as I dug deeper, I found out that some surveys that were “Christian-based” actually included non-Christians in their report. So, I had to discount them. I think the research portion was the most difficult and time intensive of all the things that I did. Morgen: It certainly can be, but like editing, it’s vital to get it right because there will always be someone willing to pick you up on something. Do you have pieces of work that you think will never see light of day? Morgen: That’s a shame. I like to think that I’ll be able to whip all my earlier pieces into shape, although some of my poetry is dire. Do you have to do much marketing for your published works or indeed for yourself as a ‘brand’? Yves: Actually, I’m just starting to “brand” myself. I created an author’s page and a Facebook page. It has helped give me some exposure. I’m considering hiring a mentor to help me through this process. Morgen: Speaking to other authors will help. Marketing is hard, and very time-consuming but we do get to meet potential readers so it’s invaluable. What’s your favourite / least favourite aspect of your writing life? Has anything surprised you? Yves: I actually enjoyed every part of the process. Morgen: That’s great to hear. I say I don’t like editing or research but they’re still writing-related so I do enjoy them, just less would be nice. What advice would you give aspiring writers? Yves: I would tell them to have a framework. Then simply write…. write, then write some more. Also, find an editor / proofreader to tweak their work. Lastly, don’t get frustrated. Morgen: Great advice, thank you. What do you do when you’re not writing? Yves: I’m attending Bethel Seminary and developing Christ Is My Savior Ministries. I also spend a lot of time with the love of my life, Jennifer. Yves: I’m involved in a few on Linkedin. Morgen: Which is probably how we ‘met’. What do you think the future holds for a writer? Yves: I think the sky is unlimited for a writer. Morgen: It certainly can be, we just have to want it enough (I do :)). Where can we find out about you and your writing? Yves: Please go to http://christismysaviorministries.org, https://www.facebook.com/pages/Christ-Is-My-Savior-CIMS-Ministries/208609585891303 or http://elderyvesjohnson.wordpress.com. Yves: Thank you for this wonderful opportunity. I hope we establish a lasting relationship. Be blessed. Morgen: You’re very welcome, thank you for joining me today. You’d be very welcome to return for another aspect, there’s plenty of choice – it’s all listed on https://morgenbailey.wordpress.com/submission-information/opportunities-on-this-blog. Is there anything you’d like to ask me? Yves: Can I give you a signed copy of my book. Morgen: It’s very kind of you but no need – I’m in the UK so it would be expensive but thank you for the kind offer. Yves is the President of Christ Is My Savior Ministries (CIMS). He served 25 years in the United States Air Force and held various leadership and management positions. He is a student at Bethel Seminary and studying for his Masters in Divinity. 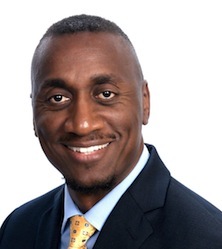 Yves is the author of There Is No Gray In Moral Failure: A Practical Guide In Preventing Financial and Sexual Misconduct. You can purchase this book at Amazon or Createspace. Yves serves with the Fishers of Men For Jesus Ministries. Yves and his wife Jennifer have three adult children: Alexandria, Anastacia and Anterria and one granddaughter, Aleana.